GOOD NEWS!! Kid Nepro brings you new sounds to play with for the holidays. 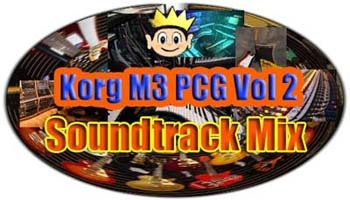 Korg M3 Volume #2 – Soundtrack/Film Mix our followup to our popular “Proto Rock” collection, is now available. The new collection contains 64 programs, 32 combis and 60 megs of new samples including over 100 new samples from our “Effectron” sound effect library. All well crafted and fully KARMA-fied to produce only the highest quality sounds for the M3 series music workstations. While Proto Rock was more “meat and potatoes” type sounds, this new PCG sound collection is more unique. M3 Soundtrack is perfect if you’re doing television, film work or video game scoring and you require background effects, killer pads and synth sounds or unique rhythms not found in the M3 factory presets. Using KARMA GE’s and real time controls, we have created an assortment of different “atmospheres” that can be used as background to a video track. Many of the sounds can also be used in New Age or Synth type audio tracks. With KN Soundtrack, we have tried to do some new things using the effect samples. Combis 9,11,12 & 31 have some interesting loops that trigger the samples using KARMA drum patterns. As far as we know that’s never been done before. We think you will enjoy those. The demo “Johnsons World” features one of the loops. It’s one of our favorite samples! Great how you can tune it down so low without any aliasing. As with Proto Rock, we will be adding more sounds in future updates and all KN Soundtrack owners will be eligible for free updates and discount prices. If you need any more info please contact us via phone or e-mail. Thanks again for your support and happy holidays!